72" Double Sink Cabinet - Travertine Top, Undermount Ivory Ceramic Sinks (3-hole) Features: Roman Vein-Cut Travertine Counter top 12-Drawers and 2-Door storage with shelves Ivory Ceramic under mount Sinks Distressed cabinet design Big cutout back for plumbing installation Overall Dimensions: W=72" D=22" H=36" Tolerance:(+/- 1/2") Disclaimer Due to the nature of our all natural stones, our stone counters & sinks may have a variation in color, discolorations or other such related birthmarks. Silkroad Exclusive uses all natural stones that come from the Earth, formed in natural processes, and so many contain imperfections. If you have any questions about this product by Silkroad Exclusive, contact us by completing and submitting the form below. If you are looking for a specif part number, please include it with your message. 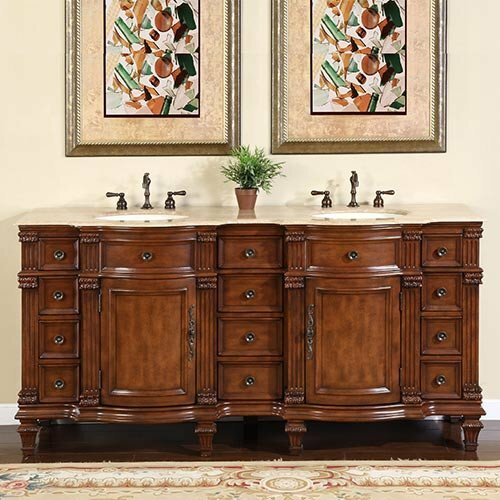 Silkroad Exclusive HYP-0715-BB-UIC-48 Ashley 48"
Silkroad Exclusive Bathroom Vanity HYP-0206-BB-UIC-33 Empress 33"